After a bit of a disappointing first impression, these running shoes get better and better. 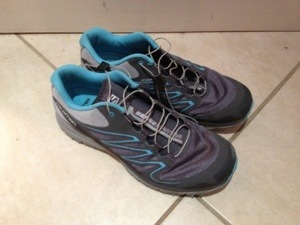 When Fitness Footwear offered me a pair of Salomon running shoes to try I thought twice as I’d not found other Salomon models right for me in the past but a read of the Fitness Footwear and Salomon web sites I found that one of their newer shoes, the Sense Mantra might be right up my street and address some of the reasons why their other models weren’t for me in the past. They arrived, I put them straight on to potter about indoors and was a bit deflated. My first impression was that they felt very straight, stiff and inflexible and the quick pull lace system was hard to get a good heel fit so the overall impression was that I was wearing a lot of shoe. I didn’t run in them straight away and put them to one side for another day. Meanwhile my cheeky son borrowed them over the weekend and suggested they were great for him! When I tried them on again after this they felt much more flexible and foot hugging so I lent them to him to wear-in for me before I ran in them. I found them more and more flexible and comfortable with wear, the 6mm drop is ideal for me and felt natural. Once worn in I also found I could get a better fit with the lacing. They are lightweight with a roomy toe box and very stable, I tested them doing single leg squats and had no ankle wobble at all! I ran on road and a bit of ‘trail’ within the park, they felt light and comfortable and had good grip on road, path and grass. I need to take them for a run somewhere a little more off-road than the park, their toe protection and stability would make them a great choice for running more challenging stony conditions. Some running shoes feel great at the first try-on and later disappoint after weeks of running. The Sense Mantra feels better with each wear. I think by the time my son outgrows these shoes, they will be worn-in and about perfect. 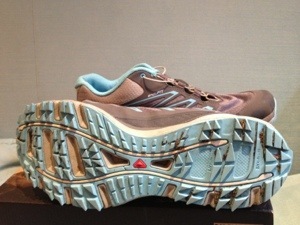 Categories: Product review, running | Tags: running shoes, Salomon Sense Mantra, trail running, Trail shoes | Permalink.